Talk About Random! 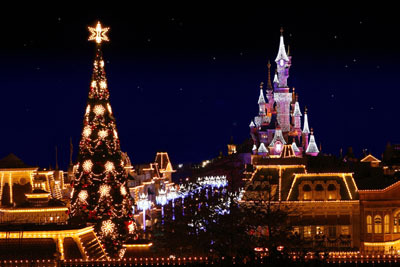 : Holiday Season in Different Countries! Holiday Season in Different Countries! Finally 25 days till Christmas Day! Hopefully everyone is filled with Holiday Spirit!! No matter what religion you are in, and what you believe and what you don't believe; it's always good to have at least a day to relax, and forget about all the dark and gloomy unpleasant memories! There are other religious and secular festival held around the time of Christmas. Hanukkah is the Jewish Festival of Lights and it remembers the rededication of the second Jewish Temple in Jerusalem. This happened in the 160s BC (before Jesus was born). (Hanukkah is the Jewish word for 'dedication'.) Hanukkah last for eight days and starts on the 25th of Kivlev, the month in the Jewish calendar that occurs at about the same time as December. Because the Jewish calendar is lunar (it uses the moon for its dates), Kivlev can happen from late November to late December. In 2012, Hanukkah will start on December 8th. During Hanukkah, on each of the eight nights, a candle is lit in a special menorah (candelabra) called a 'hanukkiyah'. There is a special ninth candle called the 'shammash' or servant candle which is used to light the other candles. 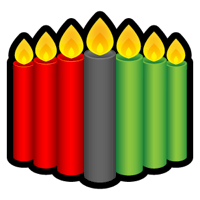 The shammash is often in the center of the other candles and has a higher position. On the first night one candle is lit, on the second night, two are lit until all are lit on the eighth and final night of the festival. Traditionally they are lit from left to right. A special blessing, thanking God, is said before or after lighting the candles and a special Jewish hymn is often sung. The menorah is put in the front window of houses so people passing can see the lights and remember the story of Hanukkah. Most Jewish family and households have a special menorah and celebrate Hanukkah. Hanukkah is also a time for giving and receiving presents and gifts are often given on each night. Lots of games are played during the time of Hanukkah. The most popular is 'dreidel' (Yiddish) or 'sivivon' (Hebrew). It's a four sided top with a Hebrew letter on each side. The four letter are the first letter of the phrase 'Nes Gadol Hayah Sham' which means 'A great miracle happened there' (in Israel, 'there' is changed to 'here' so it's 'Nes Gadol Hayah Po'). Player put a coin, nut or chocolate coin in a pot and the top is spun. In the letter 'nun' (נ) come up nothing happens, if it's 'gimel' (ג) the player wins the pot, if it's 'hay' (ה) you win half the pot and if it's 'shin' (for 'there' ש) or 'pe' (for 'here' פ) you have to put another item into the pot and the next person has a spin! About 200 BC Israel was a state in the Seleucid Empire (an empire ruled under Greek law) and under the overall charge of the King of Syria. However, they could follow their own religion and its practises. In 171 BC, There was a new King called Antiochus IV, who also called himself Antiochus Epiphanes which means 'Antiochus the visible god'. Antiochus wanted all the empire to follow Greek ways of life and the Greek religion with all its gods. Some of the Jews wanted to be more Greek, but most wanted to stay Jewish. On his way home from having to retreat from a battle, Antiochus stopped in Jerusalem and he let out all his anger on the city and the Jewish people. He ordered houses to be burned down and tens of thousands of Jews were killed or put into slavery. Antiochus then went to attack the Jewish Temple, the most important building in Israel to Jews. The Syrian soldiers took all the treasures out of the temple and on 15 Kivlev 168 BC Antiochus put up a status of the Greek god Zeus in the centre of the Jewish Temple (but it had the face of Antiochus!). Then on 25 Kivlev he desecrated the most holy place in the temple and destroyed the Jewish holy scrolls. When they got back to Jerusalem, the Temple was in ruins and the statue of Zeus/Antiochus was still standing. They cleaned the Temple. They rebuilt the Jewish alter and on 25 Kivlev 165 BC, exactly three years after the statue was put up, the alter and Temple was rededicated to God. The dates of Hanukkah and Christmas might well be associated because 25 Kivlev was when the Temple was rededicated and the early Church chose December 25th because they took over the birthday of Greek god Zeus/Roman god Jupiter. Mazao: The Crops - Fruit and vegetables from the harvest. These normally includes bananas, mangoes, peaches, plantains, oranges, or other favourites! They are shared out. Muhindi: The Corn - There is one ear of corn of each child in the family. If there are no children in the family, then one ear is used to represent the children in the community. It represents the future and the Navtive Americans. Everyone has to start the year with a bright smile on their face no matter what, and look forward toward the future. What is everyone up to this Holiday Season, a lot of shopping, eating, dancing, drinking, or sleeping? Here in Japan it's more of a lover's day, lol. Anyway keep reading this post and you learn about Christmas and how some countries celebrate it. It's really quite interesting and it is always to have an open mind on different cultures. For more information on different, or you did not find a country in particular click here. Christmas is not widely celebrated in Japan as not many people there are Christians. However, several customs have come to Japan from the USA such as sending and receiving Christmas Cards and Presents. In Japan, Christmas in known as more of a time to spread happiness rather than a religious celebration. Christmas eve is often celebrated more than Christmas Day. Christmas eve is thought of as a romantic day, in which couples spend together and exchange presents. In many ways it resembles Valentine's Day celebrations in the UK and the USA. Young couples like to go for walks to look at the Christmas lights and have a romantic meal in a restaurant - booking a table on Christmas Eve can be very difficult as it's so popular! Christmas is not a national holiday in Japan, so schools and businesses are normally open on December 25th. In Japan Santa is known as サンタさん、サンタクロース santa-san (Mr Santa). Another Japanese gift bringer is Hoteiosho, a Japanese god of good fortune from Buddhism and not really related to Christmas. Fried chicken is often eaten on Christmas day. It is the busiest time of year for restaurants such as KFC and people can place orders at their local fast food restaurant in advance! 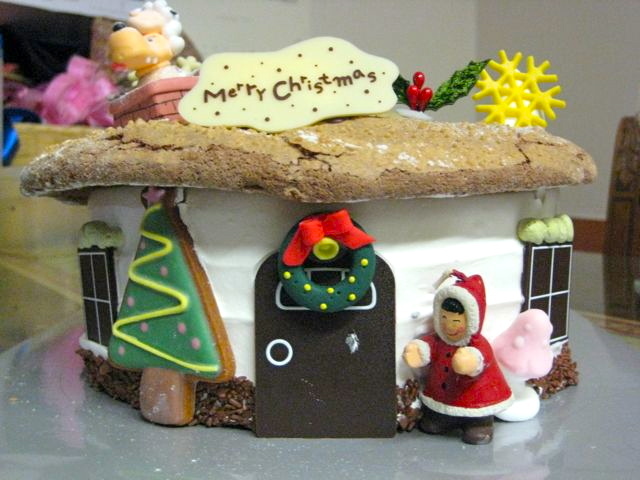 The traditional Japanese christmas food is christmas cake, but it's not a rich fruit cake, but is usually a sponge cake decorated with strawberries and whipped cream. Thank you to Sarah Marie Casey for her help in giving me information on Christmas in Japan! 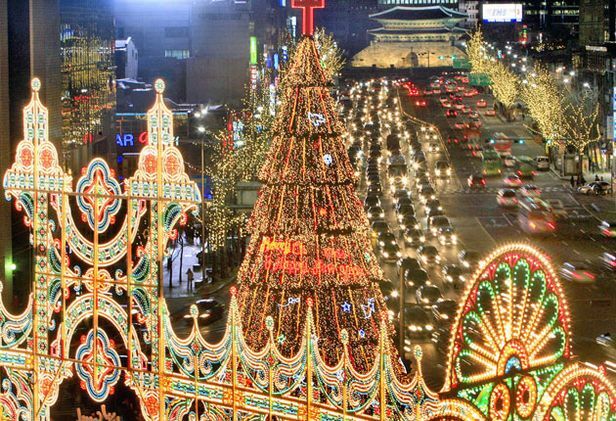 There are more Christians in South Korea (the Republic of Korea) than in other asian countries such as China and Japan, so Christmas is celebrated more widely. (Christians make up about 25-30% of the population.) However, the other 70% of people in South Korea are Buddhist (about 25%) or don't have a religion. Unlike Japan, Christmas is an official holiday - so people do have the day of work and school! But they go back on the 26th (Boxing Day). There's a longer official winter break in the New Year. Department stores put on big displays of decorations. There's also an amazing display of lights in the capital city, Seoul. The lights are all over the city centre including the bridges over the Han River. Some people (especially Christians and westerns who live in South Korea) will have decorations at home including a Christmas tree. Happy/Merry Christmas in Korean is 'Sung Tan Chuk Ha'. Happy/Merry Christmas in lots more languages. Thank you to Heidi Wenger for her help in giving me information on Christmas in South Korea! From December 16th to Christmas Eve, children often perform the 'Posada' processions or Posadas. Posada is Spanish for Inn or Lodging. There are nine Posadas. These celebrate the part of the Christmas story where Joseph and Mary looked for a room in an Inn. For the Posadas, the outside of houses are decorated with evergreens, moss and paper lanterns. One game that is often played at Posada parties is Piñata. A piñata is a decorated clay or papier-mâché jar filled with sweets and hung from the ceiling or tree branch. The piñata is often decorated something like a ball with seven peaks around it. The peaks or spikes represent the 'seven deadly sins'. Piñata's can also be in the form of an animal or bird (such as a donkey). To play the game, children are blind-folded and take it in turns to hit the piñata with a stick until it splits open and the sweets pour out. Then the children rush to pick up as many sweets as they can! In Mexico, children get their main presents at Epiphany (January 6th). (see Spain for more information). In Mexico Epiphany is known as 'El Dia de los Reyes' (the day of The Three Kings). The presents are left by the Three Kings (or Magi). It's traditional to eat a special cake called 'Rosca de Reyes' (Three Kings Cake) on Epiphany. A figure of Baby Jesus is hidden inside the cake. Whoever has the baby Jesus in their piece of cake is the 'Godparent' of Jesus for that year on another important day, Candelaria which is on the 2nd February and is the end of the Mexican christmas celebrations! February 2nd 'Candelaria' (it's called 'Candlemas' in many parts of the world) is the day when Christians remember when Jesus was taken to the Temple as a baby and officially named. Lots of Mexicans have a party for Candelaria. The largest ever Angel Ornament was made in Mexico. It was made in January 2001 by Sergio Rodriguez in the town of Nuevo León. The angel was 18' 3"" high and had wing span of 11' 9"! Perhaps the most amazing thing about the angel was that it was completely made out of old beer bottles, 2946 of them! In the days of the Soviet Union, Christmas was not celebrated very much. New Year was the important time. Now Christmas is celebrated normally on the January 7th (only a few Catholics might celebrate it on the 25th December). The date is different because the Russian Orthodox church uses the old 'Julian' calendar for religious celebration days. The Orthodox Church also celebrates Advent. But it has fixed dates, starting on 28th November and going to the 6th January, so it's 40 days long. 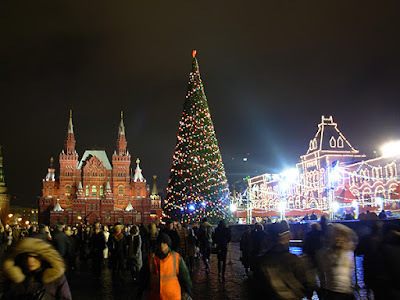 The official Christmas and New holidays in Russia last from December 31st to January 10th. 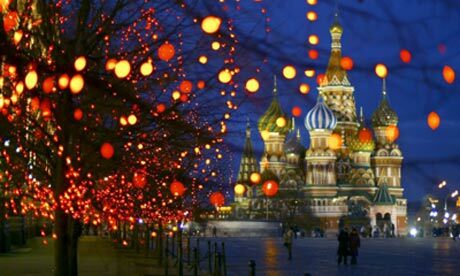 The Russian Christmas greeting is 'S Rozhdestvom!'. 'Vzvar' (meaning 'boil-up') is often the end of the meal. It's a sweet drink made from dried fruit and honey boiled in water. Vzvar is traditionally at the birth of a child, so at Christmas it symbolizes the birth of the baby Jesus. This is when - when 'Father Frost' (known in Russian as 'Ded Moroz' or Дед Мороз) brings presents to children. He is always accompanied by his Grandaughter (Snegurochka). 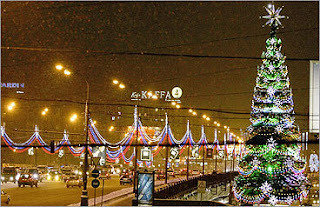 On New Year's eve children hold hands, make a circle around the Christmas tree and call for Snegurochka or Ded Moroz. When they appear the star and other lights on the Christmas tree light up! Ded Moroz carries a big magic staff. The traditional greeting for Happy New Year is 'S Novym Godom'. However, most people in Russia have never heard of the story and I've had many emails from Russian visitors to the site who have never heard the story before! It seems that it was probably created by an American poet and writer called Edith Matilda Thomas in 1907. Here's more information about how the story of Babushka came into being on another site. Everywhere she asked "Have you seen the kings?" "Oh yes," everyone told her, "we saw them. They went that way." For a day Babushka followed the trail of the kings and the villages got bigger and became towns. But Babushka never stopped. Then she came to a city. "The palace," she thought. "That's where the royal baby would be born." "No, there is no royal baby here," said the palace guard when she asked him. "What about three kings?" asked Babushka. "Oh yes, they came here, but they didn't stay long. They were soon on their journey." "But where to?" asked Babushka. "Bethlehem, that was the place. I can't imagine why. It's a very poor place. But that's where they went." replied the guard. She set off towards Bethlehem. It was evening when Babushka arrived at Bethlehem and she had been travelling for a long time. She went into the local inn and asked about the kings. "Oh yes," said the landlord, "the kings were here two days ago. They were very excited, but they didn't even stay the night." "And what about a baby?" Babushka cried. "Yes there was." Said the landlord. "The kings asked about a baby, too." When he saw the disappointment in Babushka's eyes, he stopped. "If you'd like to see where the baby was," he said quickly, "it was across the yard there. I couldn't offer the couple anything better at the time. My inn was really full, so they had to go in the stable." Children believe that Father Christmas or Santa Claus leaves presents in stockings or pillow-cases. These are normally hung up by the fire or by the children's beds on Christmas Eve. Children sometimes leave out mince pies and brandy for Father Christmas to eat and drink when he visits them. Now, some people say that a non-alcoholic drink should be left for Santa as he has to drive! There are some customs that only take place, or were started, in the UK. Wassailing is an old anglo-saxon custom that doesn't take place much today. Boxing Day is a very old custom that started in the UK and is now taken as a holiday in many countries around the world. In Scotland, some people celebrate New Year's Eve (which is called Hogmanay) more than Christmas! The word Hogmanay comes from a kind of oat cake that was traditionally given to children on New Year's Eve. Also in Scotland, the first person to set foot in a house in a New Year is thought to have a big effect on the fortunes of the people that live there! Generally strangers are thought to bring good luck. Depending on the area, it may be better to have a dark-haired or fair-haired stranger set foot in the house. This tradition is widely known as 'first footing'. In England it is sometimes said that a stranger coming through the door carrying a lump of coal will bring good luck. In Scots (a Scottish dialect) Happy/Merry Christmas is 'Blithe Yule'; in Gaelic it's 'Nollaig Chridheil'; and in Welsh (which is spoken in some parts of Wales it's 'Nadolig Llawen'. Happy/Merry Christmas in lots more languages. In the UK, the main Christmas Meal is usually eaten at lunchtime or early afternoon on Christmas Day. It was traditionally roast beef or goose, although it's common to have turkey now, roast vegetables and 'all the trimmings' which means stuffing and sometimes bacon and sausages. (In Scotland, some people might even have Haggis instead of turkey!) Dessert is often Christmas Pudding. Mince pies and lots of chocolates are often eaten as well! The dinner table is decorated with a Christmas Cracker for each person and sometimes flowers and candles. A big part of the Christmas celebrations in Germany is Advent. Several different types of Advent calendars are used in German homes. As well as the traditional one made of card that is used in many countries, there are ones made out of a wreath of Fir tree branches with 24 decorated boxes or bags hanging from it. Each box or bag has a little present in it. Another type is called a 'Advent Kranz' and is a ring of fir branches that has four candles on it. This is like the Advent candles that are sometimes used in Churches. One candle is lit at the beginning at each week of Advent. Christmas Trees are very important in Germany. They were first used in Germany during the Middle Ages. If there are young children in the house, the trees are usually secretly decorated by the Mother of the family. The Christmas tree was traditionally brought into the house on Christmas eve, and during that evening the family would read the Bible and sing Christmas songs such as O Tannenbaum, Ihr Kinderlein Kommet and Stille Nacht (Slient Night). Sometimes wooden frames, covered with coloured plastic sheets and with electric candles inside, are put in windows to make the house look pretty from the outside. In German Happy/Merry Christmas is 'Frohe Weihnacht'. Happy/Merry Christmas in lots more languages. Germany is well known for its Christmas Markets where all sorts of Christmas foods and decorations are sold. Perhaps the most famous German decorations are glass ornaments. The glass ornaments were originally hand blown glass and were imported in the USA in 1880s by the Woolworth stores. The legend of the glass 'Christmas Pickle' is famous in the USA, but it's that, a legend. Most people in Germany have never heard of the Christmas Pickle! In some parts of Germany, children write to the 'Christkind' ('The Christ Child' in English) asking for presents. The letters to the Christkind are decorated with sugar glued to the envelope to make them sparkly and attractive to look at. Children leave the letters on the windowsill at the beginning of or during Advent. The Nürnberg Christkind officially opens the Christmas market on the Friday before Advent starts. And before Christmas she has over 150 'official duties' including visiting hospitals, old people's homes and children's nurseries! She also has to give TV interviews and visit other cities. Santa Claus or Father Christmas (der Weihnachtsmann) brings the presents on December 24th. December 6th is St. Nicholas' Day and "der Nikolaus" brings some small gifts, such as sweets and chocolate, to the children. He comes in the night between the 5th and the 6th and puts the presents into the shoes of the children, who usually place them by their doors on the previous evening. In some regions of Germany, there is a character called "Knecht Ruprecht" or "Krampus" who accompanies Nikolaus (St. Nicholas) on the 6th of December. He is big horned monster clothed in rags and carries a birch. He will punish the children who were bad and will give them a birch as a present. He is usually the one who scares the little children. In other parts of Germany, St. Nicholas is followed by a small person called "Schwarz Peter" (Black Peter) who carries a small whip. Black Peter also accompanies St. Nicholas or Sinterklaas in Holland. In north west Germany Santa is joined by Belsnickel a man dressed all in fur. Some people say that Santa/Father Christmas (Weihnachtsmann) brings the presents and some say it is Christkind! Another tradition is the Sternsinger (or star singers) who go from house to house, sing a song and collect money for charity (this is a predominantly Catholic tradition). They are four children, three who dress up like the Wise men and one carries a star on a stick as a symbol for the Star of Bethlehem. When they're finished singing, they write a signature with chalk over the door of the house. The sign is written in a special way, so Christmas 2012 would be: 20*C*M*B*12. It is considered to be bad luck to wash the sign away - it has to fade by itself. It has usually faded by the 6th of January (Epiphany). The Sternsingers visit houses between December 27th and January 6th. Carp or Goose are often served for the main Christmas meal. Stollen is a popular fruited yeast bread that is eaten at Christmas. Here is a recipe for Stollen. Thank you to Céline Krimmel for her help in giving me information on Christmas in Germany! In France, a Nativity crib is often used to help decorate the house. French cribs have clay figures in them, not wooden ones. During December, some towns and cities such as Marseilles have fairs that sell Nativity figures. As well as having the normal Nativity figures in them, French scenes also have figures such as a Butcher, a Baker, a Policeman and a Priest. 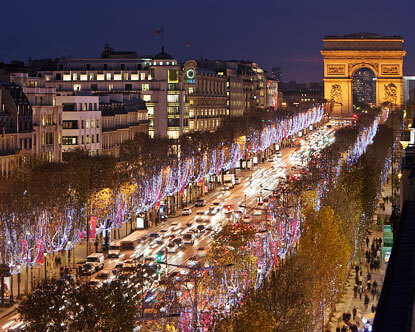 In French Happy/Merry Christmas is 'Joyeux Noël'. Happy/Merry Christmas in lots more languages. Yule Logs made out of Cherry Wood are often burned is French homes. The log is carried into the home on Christmas Eve and is sprinkled with red wine to make the log smell nice when it is burning. There is a custom that the log and candles are left burning all night with some food and drinks left out in case Mary and the baby Jesus come past during the night. In France, Father Christmas / Santa Claus / St. Nicholas is called Père Noël (Father Christmas). In eastern France he is accompanied by Le Pere Fouettard, a man dressed in black. He might be the same person as Zwarte Piet in Holland. The main Christmas meal, called Réveillon, is eaten on Christmas Eve/early Christmas morning after people have returned from the midnight Church Service. Dishes might include roast turkey with chestnuts or roast goose, oysters, foie gras, lobster, venison and cheeses. For dessert, a chocolate sponge cake log called a bûche de Noël is normally eaten. Another celebration, in some parts of France, is that 13 different desserts are eaten! All the desserts are made from different types of Fruit, Nuts and Pastries. Epiphany (see Spain for more information), called Fête des Rois in French, is also celebrated in France on January 6th. A flat Almond cake is eaten called 'Galette des Rois'. The cake has a toy crown inside and is decorated on top with a gold paper crown.